Near the peaks of the Himalayan Mountains, a harsh region in which no human settlements are found, lives the world’s largest honey bee, the Himalayan Cliff Bee which can grow as large as three centimeters in length. The red honey produced by these bees is unlike any honey you’d find on a supermarket shelf as it possesses fascinating psychoactive properties that are prized by the locals of Nepal and China for its ability to help those with diabetes, poor sexual performance, hypertension, and more. Acquiring this elusive honey is no simple task, however. In addition to the fact that you’re working with bees, an already risky task, and you must brave the peaks of the Himalayas, the hives themselves are built high into the faces of the Himalayan cliff-sides with altitudes exceding 2,500, meaning one wrong move can cost a harvester their life. 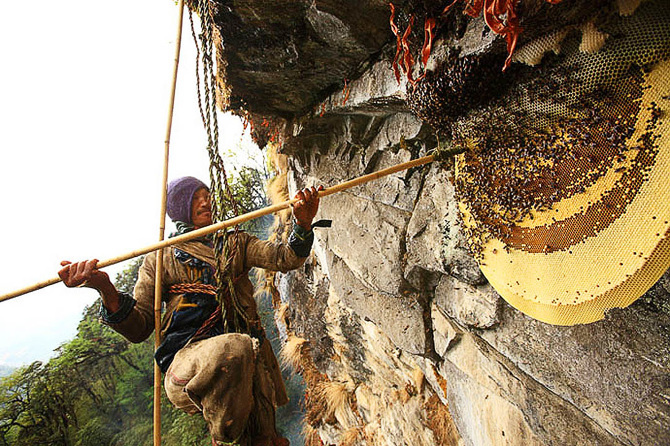 A tribe of Gurungun people commonly referred to as the honey hunters are group of daring individuals that face the risks and make a living off of the rare honey. The hives grow up to 5 feet in diameter and can contain up to 60 kg of honey each, an impressive yield. Honey is collected from the hives twice a year, once in the spring and again in the autumn. Believed to be a result of the influx in the region’s flower population during the spring time, the honey extracted in spring seems to have noticeably stronger effects and, in turn, is the most sought after batch of this mystical substance. Mad honey, also known as red honey, is produced by the Himalayan cliff bee (Apis dorsata laboriosa), the largest bee in the world at just over 3cm long. It is the highland sub species of a relatively common bee, Apis dorsata, however only the highland species has access to the Rhododendron flowers that make it’s honey mad. Many Rhododendron species contain grayanotoxins, which is why they are widely known to be poisonous to humans. In the highlands of the himalayas; Bhutan, Yunnan (China), India and Nepal, the rare Himalayan cliff bee lives along side Rhododendrons (e.g. Rhododendron luteum and Rhododendron ponticum), and frequently collects nectar from their poisonous flowers. Honey made from the nectar of the poisonous Rhododendron flowers comes with some pretty potent properties. Mad honey is known to be a powerful hallucinogen and recreational drug as well as being ascribed many medicinal features. The honey is thought to be effective in treating everything from hypertension and diabetes to poor sexual performance, when taken in small doses. In large doses it can be highly toxic and even fatal. In small amounts, the honey is intoxicating, giving a feeling of relaxation and a pleasant dizziness and tingling sensation. It can be hallucinogenic, although there is little scientific literature regarding it’s effects.